Former Environment Secretary Owen Paterson tells Business Insider there will be “very dangerous” consequences if Theresa May sticks to her Brexit plans. He refuses to rule out the possibility of civil unrest if May continues with her so-called Chequers agreement for leaving the EU. His comments come as the prime minister prepares to address Conservative conference. 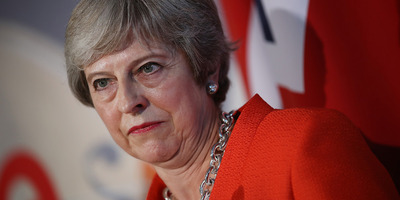 The prime minister has come under pressure this week from the right of her party to drastically change course or face being replaced by the former Foreign Secretary Boris Johnson. BIRMINGHAM, ENGLAND – There will be “very dangerous” consequences for the country if Theresa May refuses to drop her plans for Brexit, the former Environment Secretary Owen Paterson has told Business Insider. Paterson, who is campaigning for a hard Brexit, told BI that May’s so-called Chequers blueprint for leaving the EU would undermine public trust in the courts, the media, and commercial institutions like the CBI, and refused to rule out the prospect of civil unrest if her plan was implemented. “There would be real, real disillusion with institutions and the establishment,” he said. “There will be a real souring across society, particularly with these extraordinarily rapid means of communications we have now. People would be really angry,” he said. The former secretary of state for Northern Ireland’s warning came at the Conservative Party’s annual conference in Birmingham, where he has been helping to lead a resistance against the Chequers plan. On Monday he spoke at a fringe meeting under a “Brexit Means Brexit” banner along with Leave-supporting colleagues Priti Patel and Andrea Jenkyns. Paterson told BI that up to 80 Tory MPs would vote against Chequers, which critics believe would keep the UK too closely tied to the EU and prevent the government from striking independent trade deals. “It’s absolutely ridiculous pursuing this thing. It’s dead,” he said. British officials had not worked out how to implement crucial elements of the plan such as the proposed new VAT system, he said, while the proposed “common rulebook” with the EU would prevent the UK striking its own laws. Theresa May insists the plan is a compromise designed to solve the Irish border issue and pass through parliament with the support of the whole party. But opposition to Chequers at the conference has been ferocious among Eurosceptic MPs and party members who have been rallying against the proposals at packed fringe events. The prime minister is due to speak at the final day of the conference on Thursday. She will tell delegates that the country’s “best days lie ahead of us” after Brexit. “Don’t let anyone tell you we don’t have what it takes: we have everything we need to succeed,” she will say.